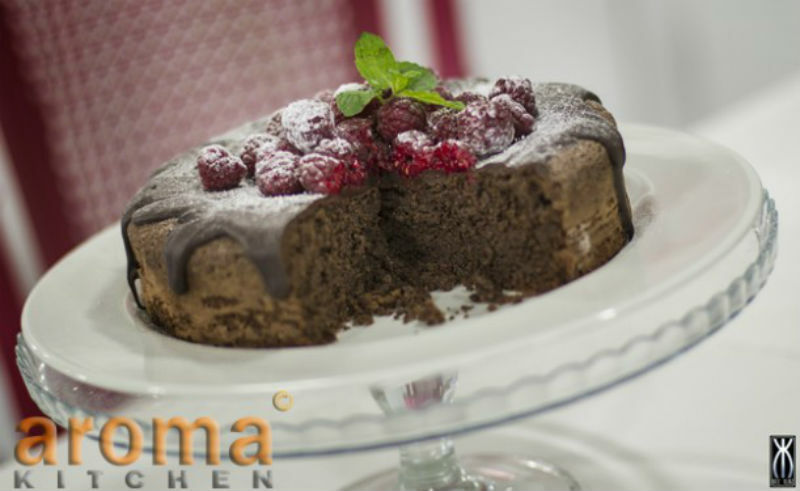 This scrumptious dessert is ideal for a gluten free diet. 1. Start this recipe by lining a 23cm spring-bottomed cake tin with greaseproof paper and grease the paper with a little oil. 2. Next, melt the chocolate, then add in the hot water and stir in well. Put aside to cool down slightly. 3. Beat the sugar and egg yolks together till thick and creamy, which should take about 10 minutes using an electric whisk. 4. Next, fold in the melted chocolate, followed by the ground almonds and baking powder. 5. In a separate bowl, whip the egg whites till stiff then fold half into the chocolate cake mixture to loosen slightly. Continue by folding in the remaining egg whites. 6. Carefully pour the mixture into the prepared tin and bake in the oven at 190oC for approximately 55 minutes. 7. Remove from the oven and allow to cool down completely in the cake tin before removing and transfering onto a serving plate. 8. Decoratively arrange the raspberries on top and dust with icing sugar before serving.